Just north of Fort De Soto Park lies a remarkable preserve accessible only by boat. Private ferries leave from Pass-a-Grille Way in St. Petersburg Beach. You may also launch your own boat from the Fort De Soto Park ramp. Shell Key is the largest in the preserve’s collection of islands, and this 195-acre undeveloped barrier island is managed to achieve a balanced blend of recreation and conservation. A vitally important shorebird nesting and resting site, Shell Key’s central core is a 110-acre Bird Preservation Area which is clearly posted as off-limits to visitors. However, there are two public use areas on the island with beach access. The northern area has two walk-throughs where you may travel from the east side of the island to the Gulf. While the occasional Magnificent Frigatebird circles overhead, watch Marbled Godwits and Wilson’s Plovers on the mudflats. Though harder to spot, Nelson’s and Saltmarsh Sparrows are present in the marsh here too. The island becomes a nursery for everything from Least Terns to American Oystercatchers in the spring/summer. Additional species of interest include Reddish Egrets, Roseate Spoonbills, Red Knots, Black Skimmers, Snowy Plovers and Wilson’s Plovers. Watch for dolphins along the way. 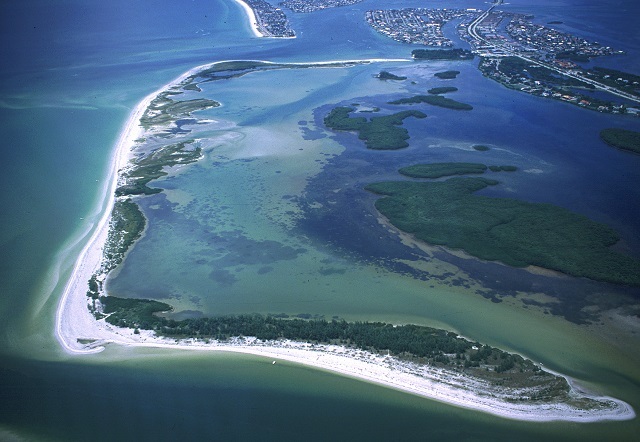 No alcohol or pets are allowed in the preserve, but you may camp on the south end of Shell Key with a free permit obtained from the county office (call for details).